The saguaro (Carnegiea gigantea) is the largest cactus in the United States and, along with the desert ironwood tree, one of the keystone plants in the Sonoran Desert. 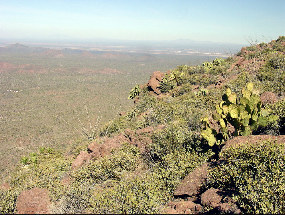 Ironwood Forest National Monument has extensive forests of saguaros, growing in densities exceeded only in Saguaro National Park. 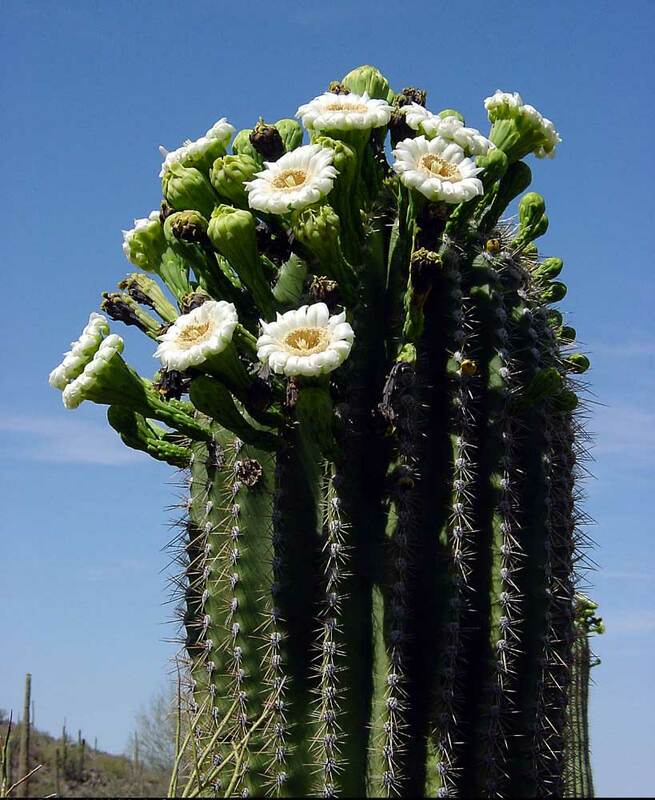 Saguaros flower heavily from mid April to early June, and the fruit ripens from mid June to mid July. 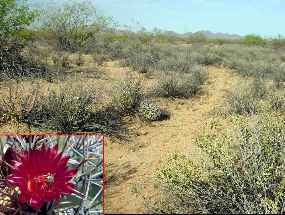 Both flowers and fruit appear in abundance during the hot, dry foresummer, and many species of wildlife depend on them for food and water. Imagine all these saguaros producing 100 to 200 flowers and fruit in a month and you can see how much food they provide for wildlife. 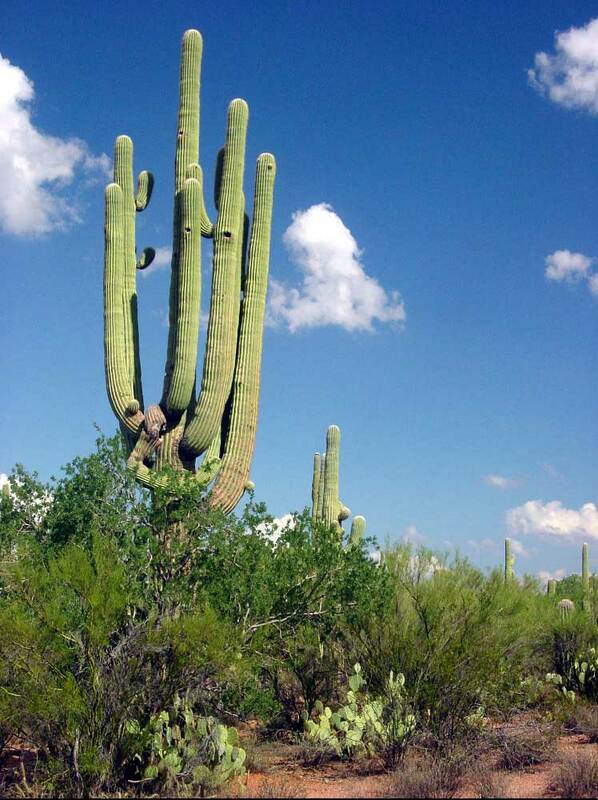 Saguaro seedlings survive only if they germinate under a tree or shrub that shades them from temperature and moisture extremes. This is an unusual number beneath one nurse tree (11). 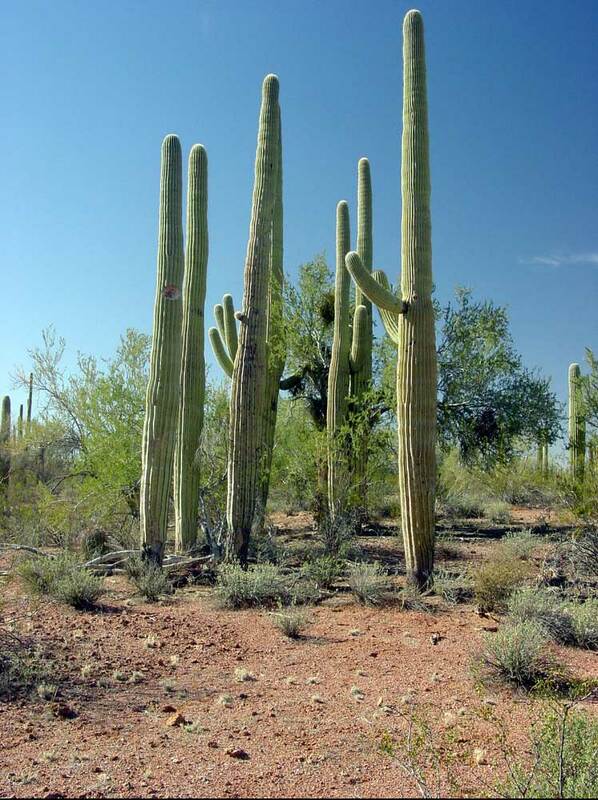 Saguaro roots radiate outward for about as far as the plant is tall, and are just beneath the surface. During dry years the roots of large saguaros intercept most of the meager moisture and the deeper roots of their nurse plants don't get enough. Nurse palo verde trees often die during droughts. 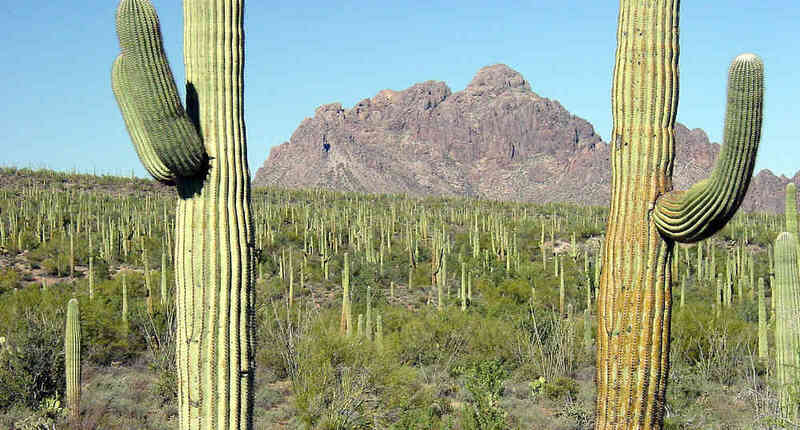 (There is a palo verde stump within the circle of saguaros above left). 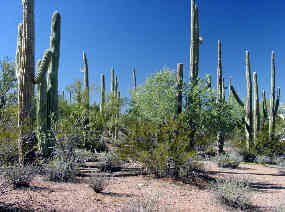 Ironwoods are more drought tolerant than palo verdes. 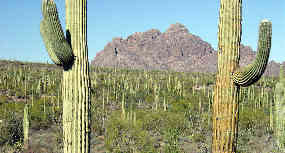 They survive even if they are sheltering one or more giant saguaros (right). 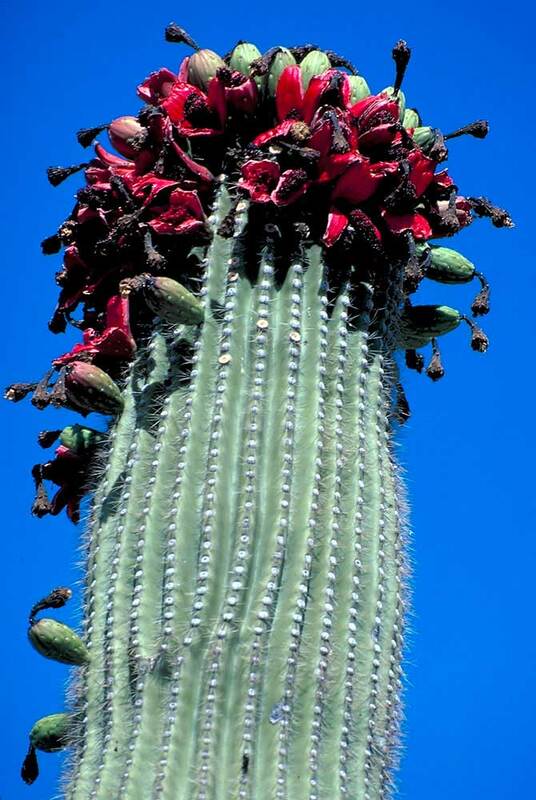 This mutant saguaro produces flower buds that never open. 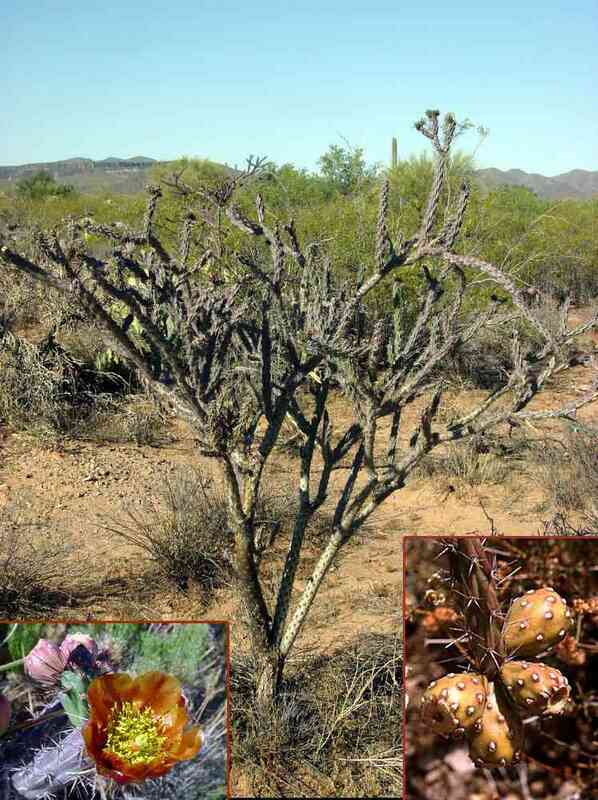 They harden into woody galls that persist on the plant for years. 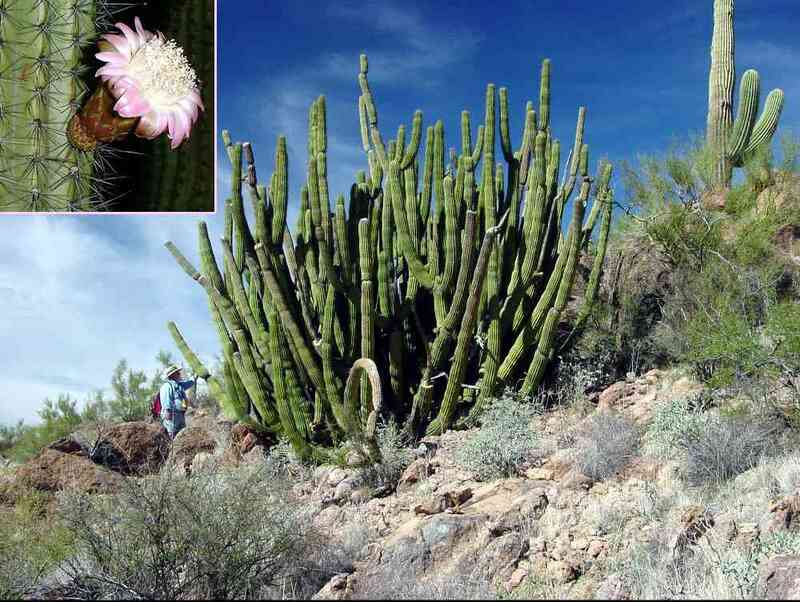 Similar mutations are known in barrel cacti and an organ pipe cactus. 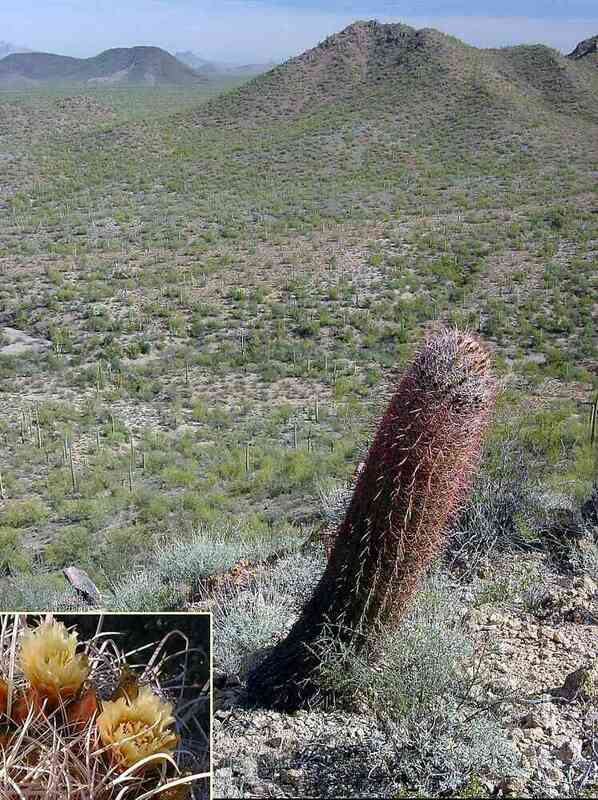 A single giant specimen of organ pipe cactus (Stenocereus thurberi) was found in IFNM. 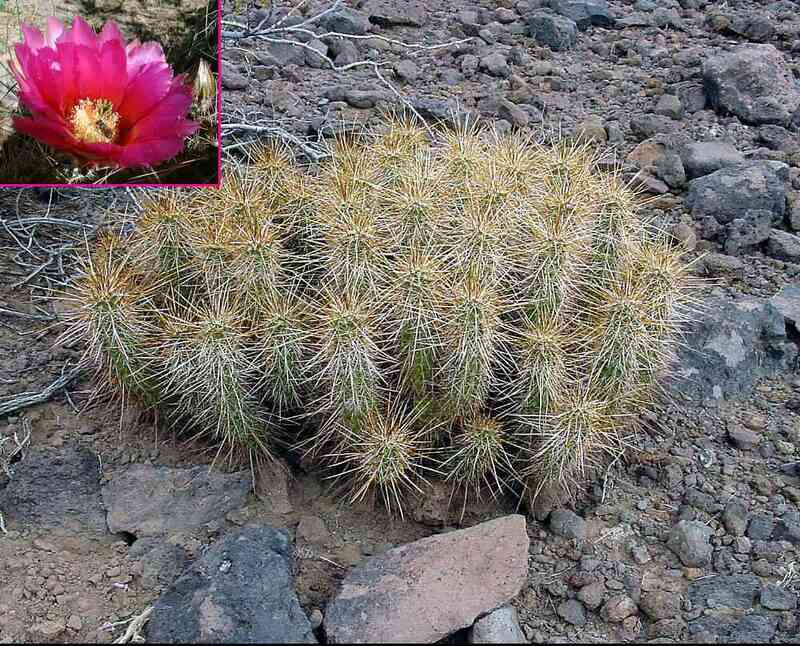 Most of the region is too cold or dry for this tropical cactus to survive. This one is on a warm south-facing slope in the Roskruge Mountains. 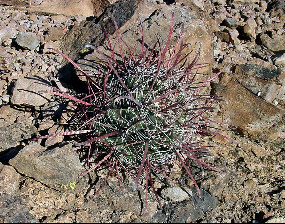 Cylindropuntia bigelovii (teddy bear cholla) is common on rocky hillsides. 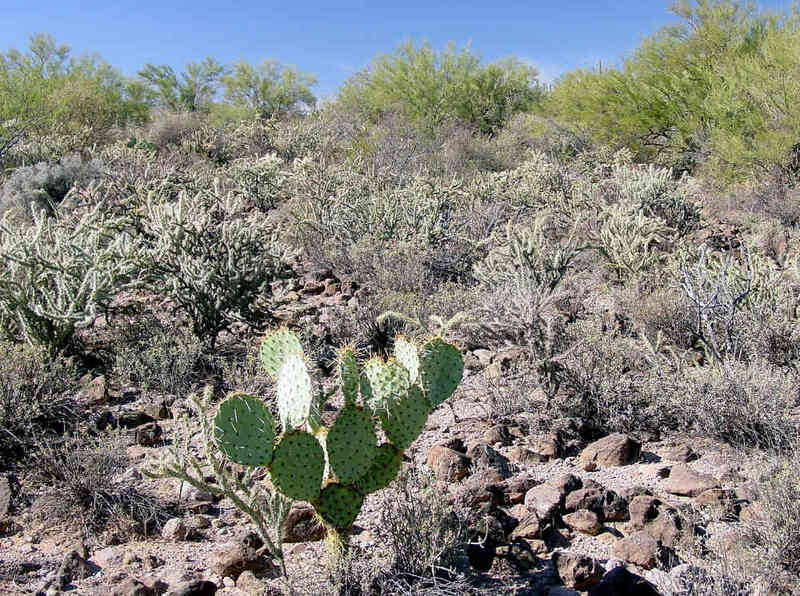 IFNM has few patches as dense as this one in the West Silver Bell Mountains. 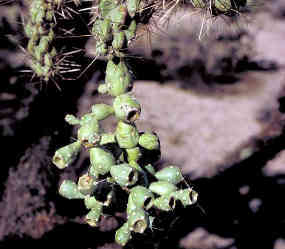 The greenish flowers rarely produce fertile seeds. Instead, joints break off easily and root to form clonal colonies. 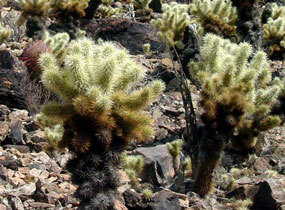 Chainfruit cholla (C. fulgida) has the same reproductive strategy but tends to grow on gentler slopes and valleys. 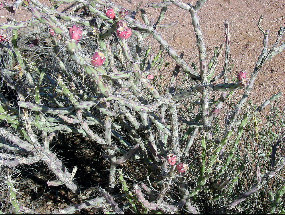 Cylindropuntia leptocaulis (Christmas cholla) ranges from rare to abundant in various parts of IFNM. 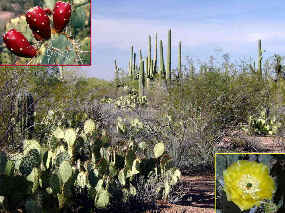 The common name comes from the red fruits that persist through winter. 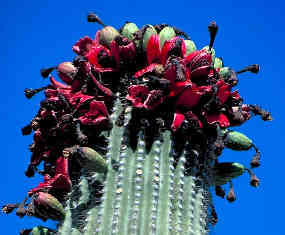 Click image to see the flowers, which open in late afternoon and close shortly after sunset. 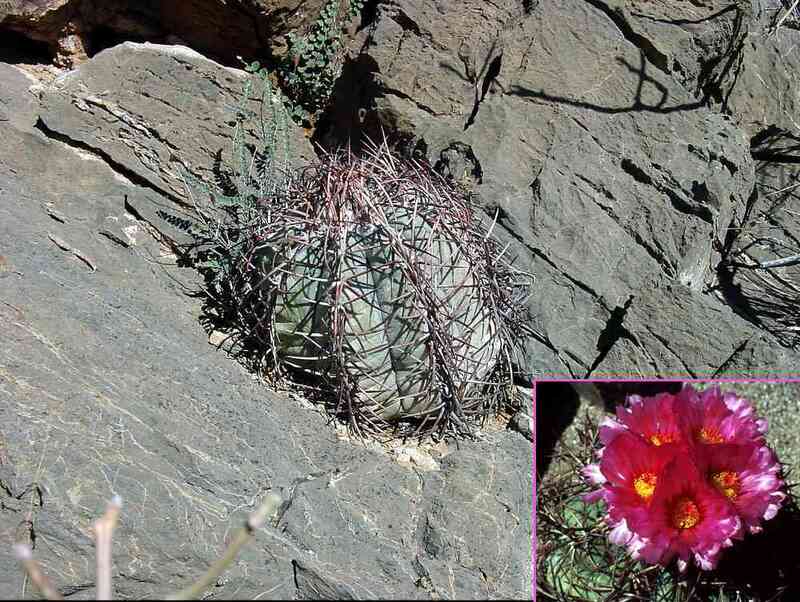 Cylindropuntia acanthocarpa (buckhorn cholla, above and right) occurs in IFNM only in the Roskruge Mountains. 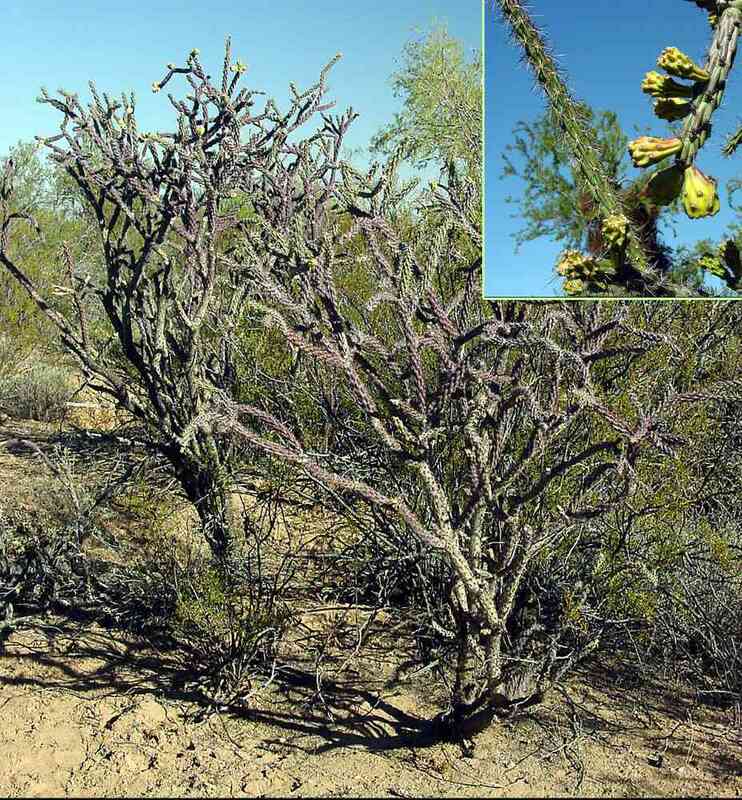 Elsewhere it is replaced by staghorn cholla (C. versicolor). Flower color is highly variable; click the right image to see more colors. 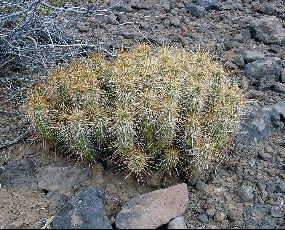 Cylindropuntia arbuscula (pencil cholla) is usually a small shrubby cactus. 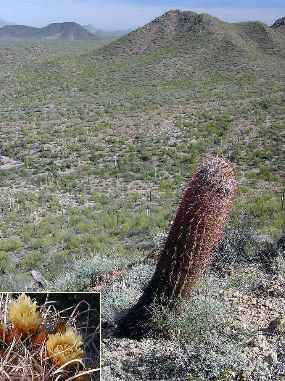 (In one valley in the Sonoran Desert National Monument to the northwest of IFNM, plants grow to 15 feet tall). 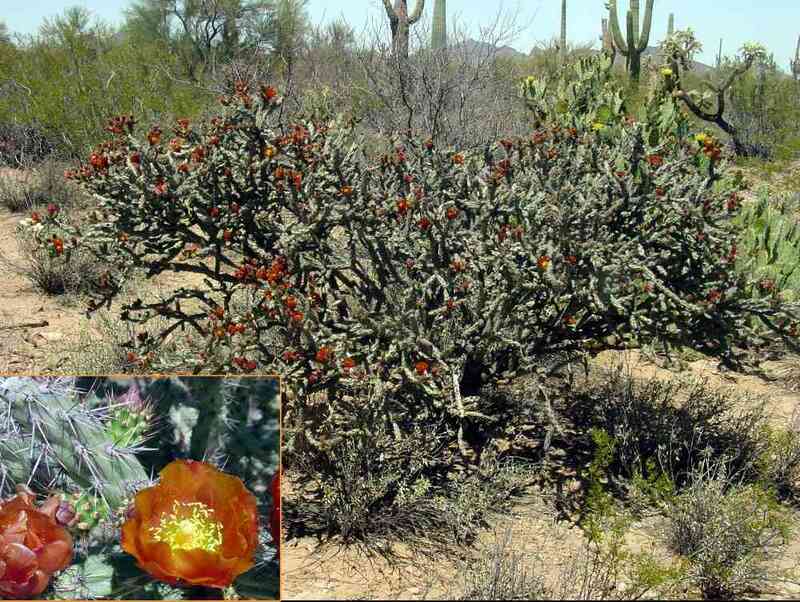 The flowers are usually yellow (inset) but some are reddish-bronze. 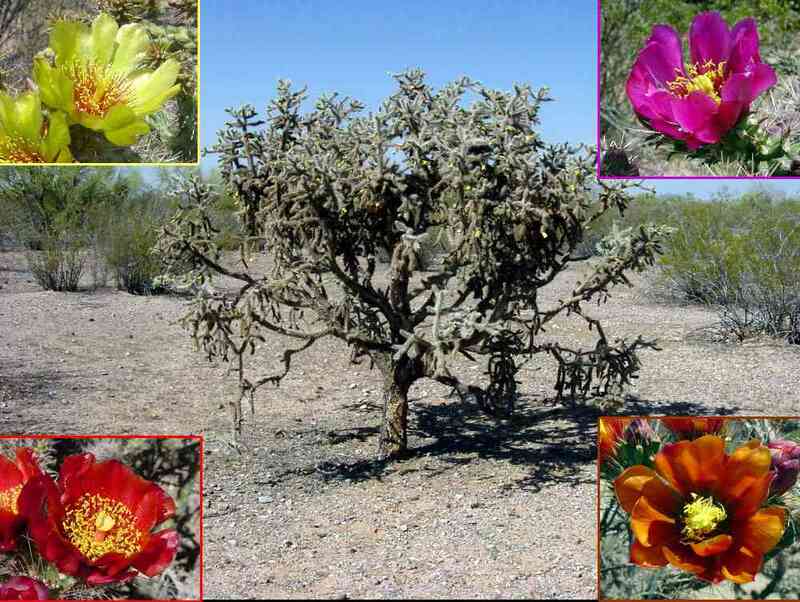 Cylindropuntia fulgida (chainfruit or jumping cholla) is a treelike cactus to 12 feet tall (main image frame). The pink flowers (inset) are produced in May and June. The fruit does not ripen and fall off. 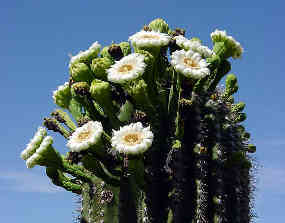 Subsequent generations of flowers grow from the persistent fruits, producing chains. Stem joints and fruits break off easily and can root to form clonal colonies. 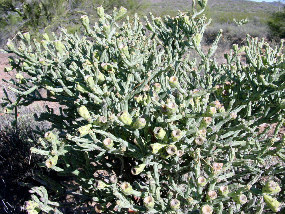 Cylindropuntia spinosior (cane cholla) is a common shrubby species. 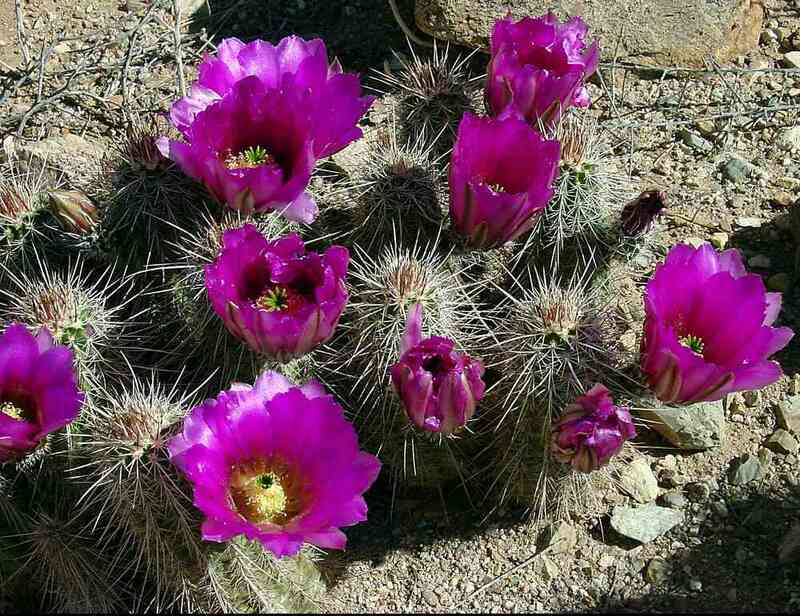 It is also common in the desert grasslands the flowers are almost always purple. 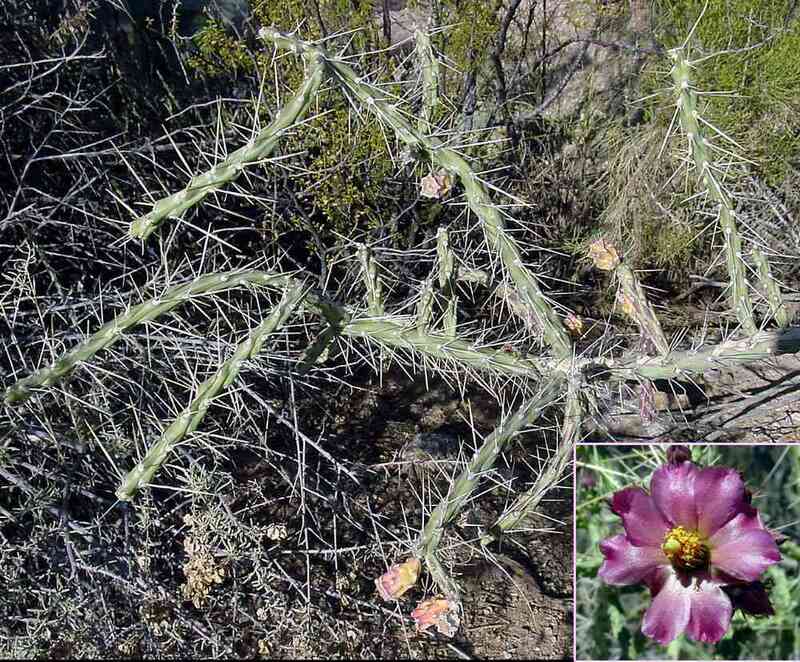 In the desert the flower color is variable (insets), probably a result of hybridization with other chollas. 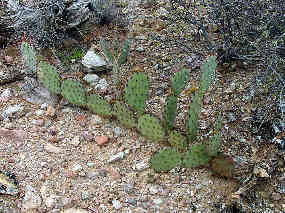 Opuntia versicolor (staghorn cholla) is common in IFNM except south of the Waterman Mountains where it is replaced by C. acanthocarpa (buckhorn cholla). 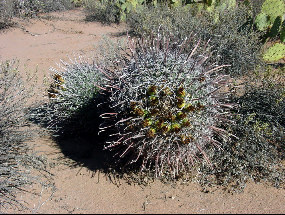 It resembles buckhorn cholla in its variable flower color and general growth form, but it usually has a short trunk with more erect branches. 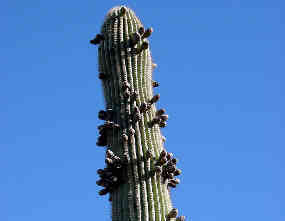 The inflated, persistent fruits are diagnostic. 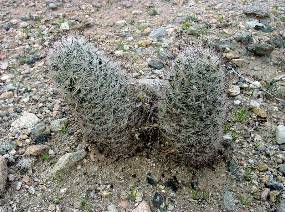 Two specimens of Cylindropuntia acanthocarpa X C. leptocaulis (buckhorn X Christmas cholla). They are uncommon but widely scattered throughout IFNM. 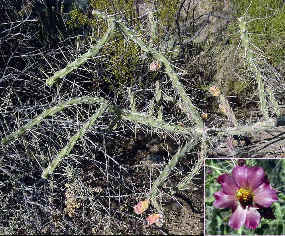 Cylindropuntia acanthocarpa X C. versicolor (hybrids between buckhorn and staghorn chollas) are common in IFNM. 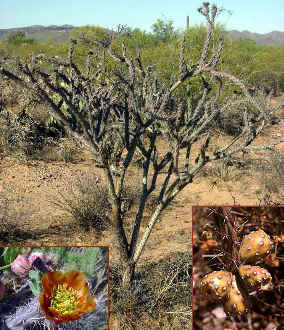 The two species are so similar that they are difficult to distinguish when not in fruit, and the hybrids complicate identification still further. 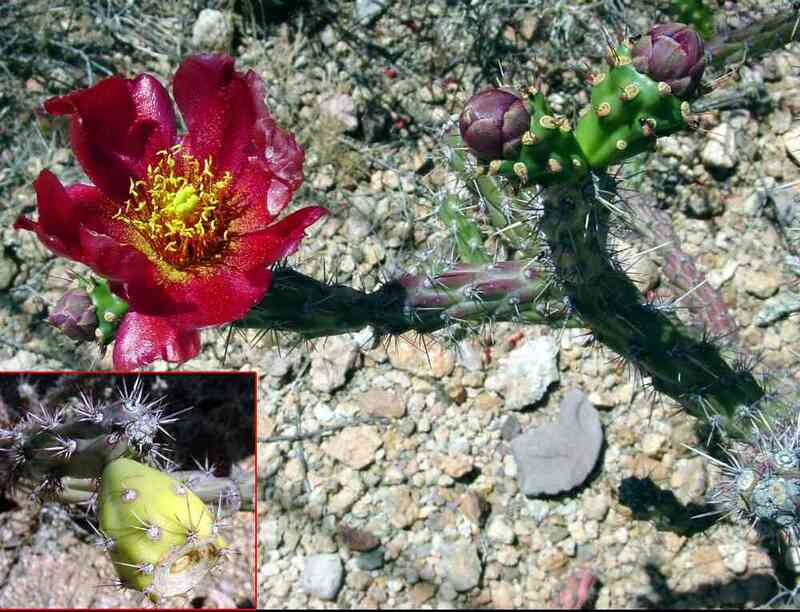 Cylindropuntia fulgida X C. leptocaulis, a hybrid between Christmas and chainfruit cholla. 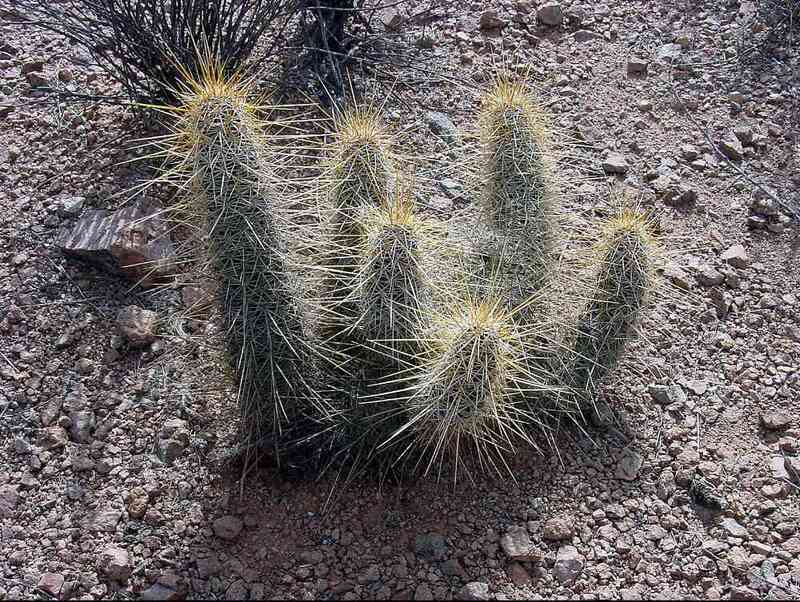 Only one plant was found of this hybrid. 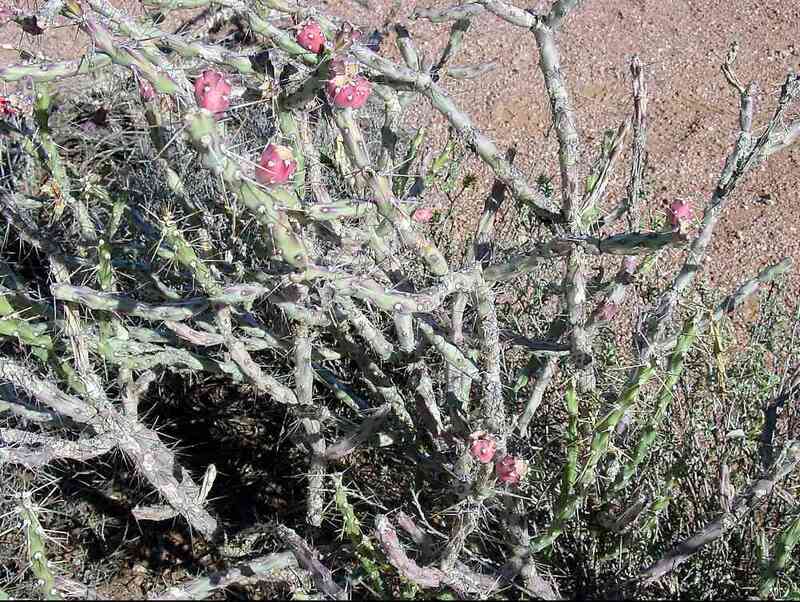 It's probably Cylindropuntia leptocaulis X C. versicolor (Christmas X staghorn cholla). Cylindropuntia X kelvinensis is a hybrid between C. fulgida and C. spinosior. 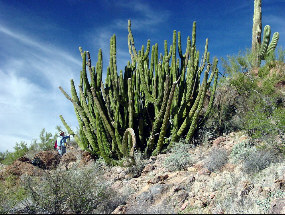 It was named kelvinensis before its hybrid nature was verified. 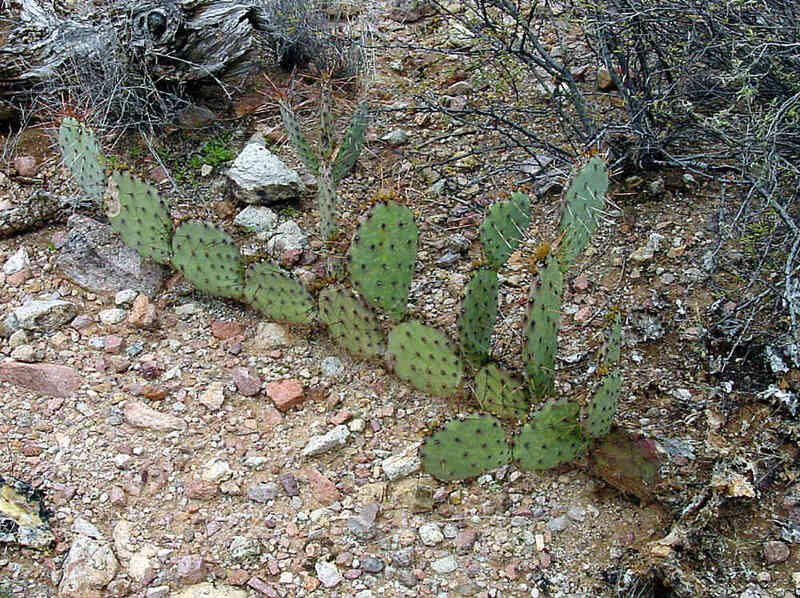 Opuntia chlorotica (Pancake prickly pear) occurs only on steep rocky slopes, usually at the upper elevation levels of IFNM. Opuntia engelmannii (Engelmann prickly pear) occurs almost throughout IFNM, though at much lower densities than in the Tucson Mountains (Saguaro National Park). It is highly variable in growth form even within populations. Part of this variability is due to the fact that it hybridizes freely with O. phaeacantha major (sprawling prickly pear). 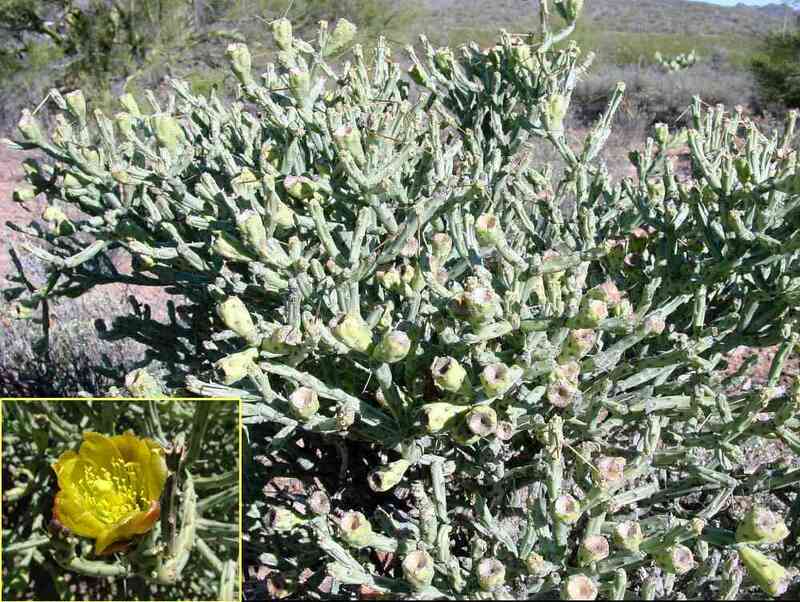 In its pure form it is a large, spreading to erect shrub with pure yellow flowers and juicy fruit. Opuntia phaeacantha major (sprawling prickly pear) is uncommon, usually even less common than its hybrids with O. engelmannii. In its pure form it is a spreading plant rarely more than two pads high. 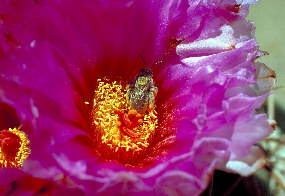 The flowers are yellow with a small bright red area at the petal bases. 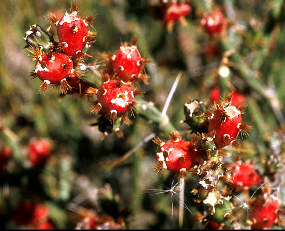 The fruit is bright red like that of O. engelmannii, but too dry to be very edible. 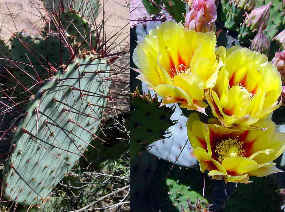 Hybrids between Opuntia engelmannii and O. phaeacantha major (Engelmann and sprawling prickly pears) are common in IFNM, sometimes as common as the former species. The plant forms range all the way between those of the parent species. Orangish petal bases are diagnostic of this hybrid. 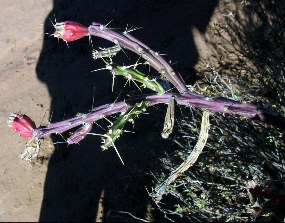 Opuntia macrocentra (long-spined prickly pear, formerly a variety of O. violacea) is widespread and occasionally common in IFNM, which is the western limit of its distribution. 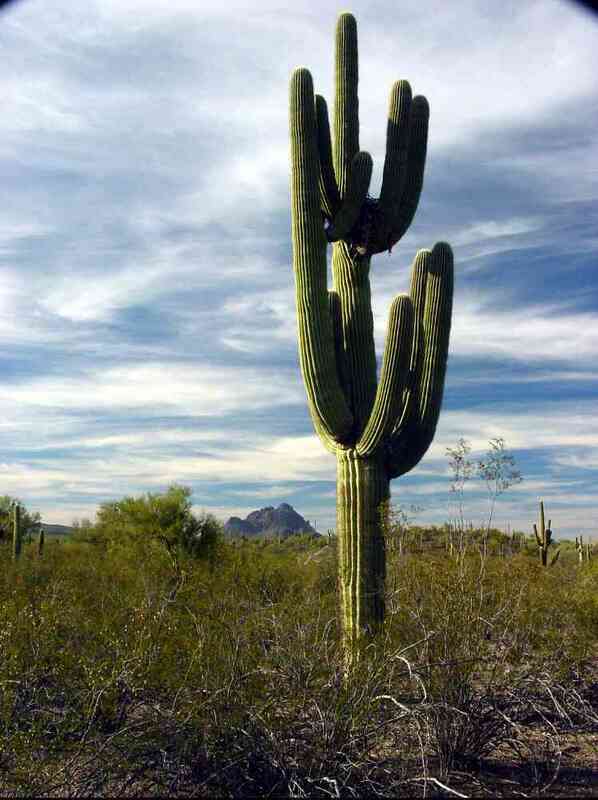 It ranges from here to western and southern Texas. 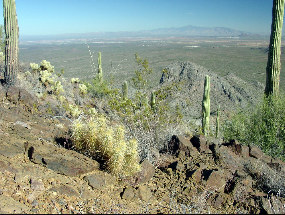 Curiously, it is absent from the Tucson Mountains (Saguaro National Park) which are geologically identical to parts of IFNM. It is a very attractive species with its long-spined, purplish pads and bright, bicolored flowers. 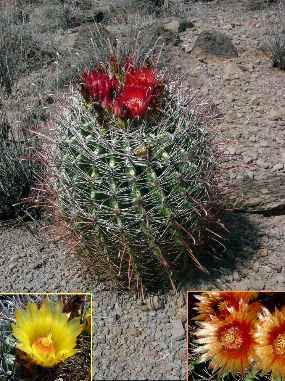 Echinocereus engelmannii acicularis (strawberry hedgehog cactus, above two images) and E. fasciculatus (robust hedgehog cactus, below) are very similar in appearance and often occur together. 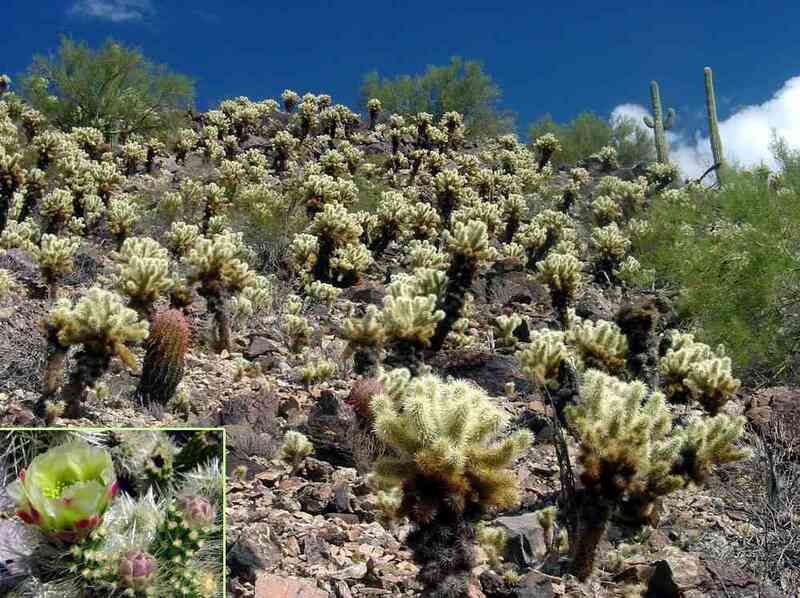 A plant of either species in full bloom is stunning and can be seen from a mile away. Above and right: Echinocereus nicholii (Nichol hedgehog cactus) is a large member of the genus; its clustered stems may approach two feet tall. It usually grows rocky slopes. 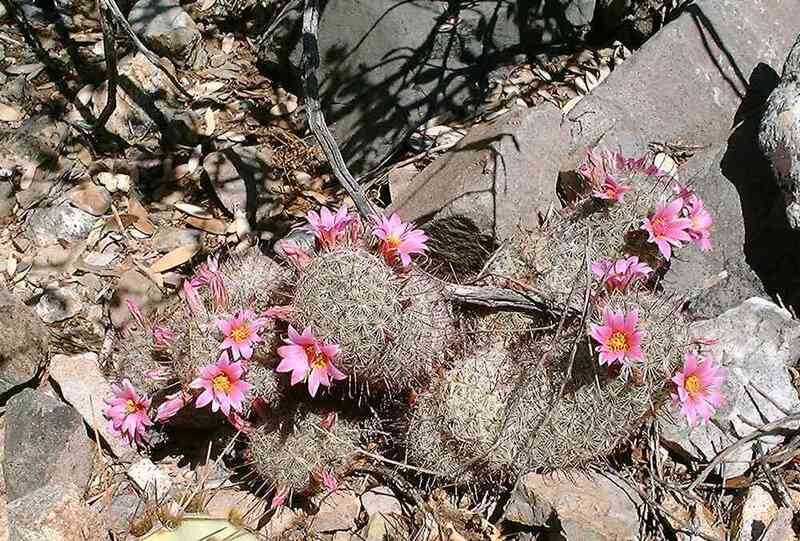 The flowers are light pink. 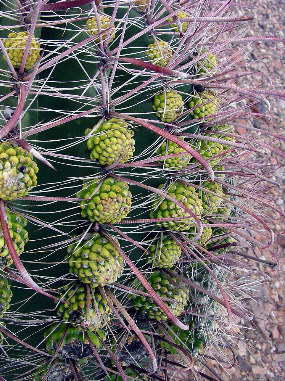 Above and below: Echinocactus horizonthalonius nicholii (Nichol's Turk's head or eagle-claw cactus) is as beautiful as it is rare. 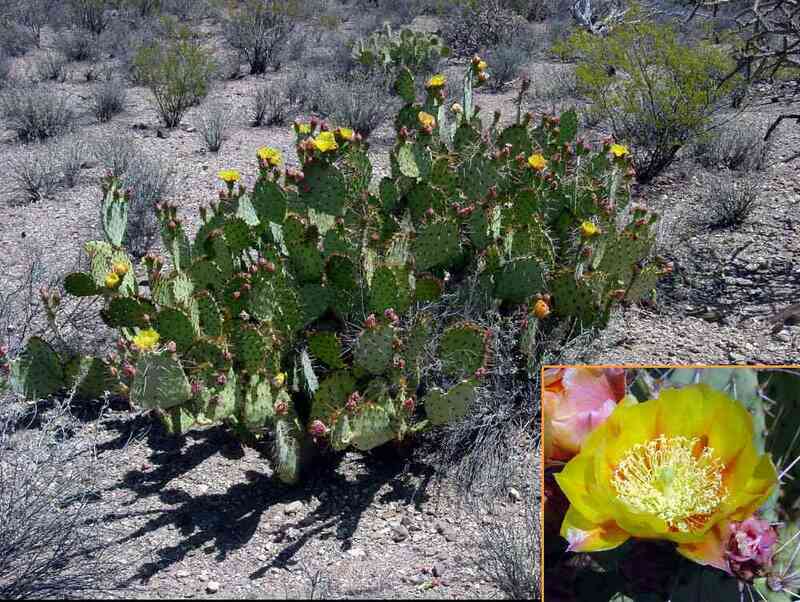 The variety E. h. horizonthalonius is common in the Chihuahuan Desert, but this federally endangered variety is known from only three populations in the Sonoran Desert. One of them is in IFNM. It is restricted to a particular type of limestone. 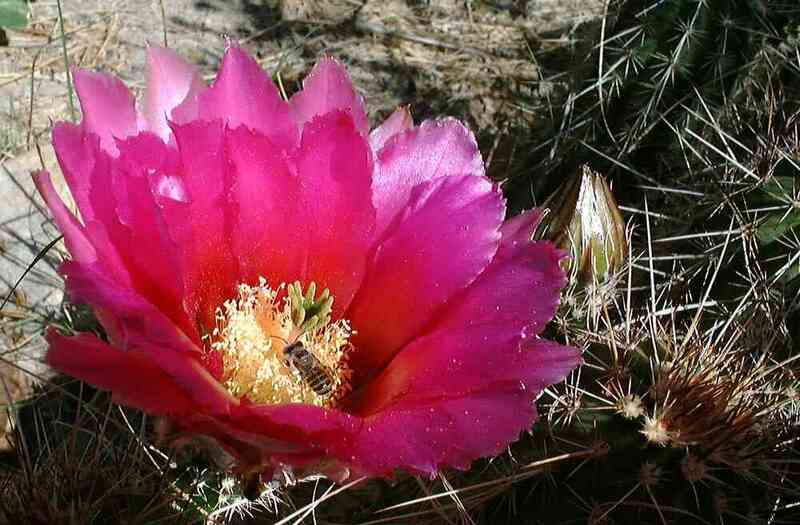 The brilliant flowers open after summer rains. 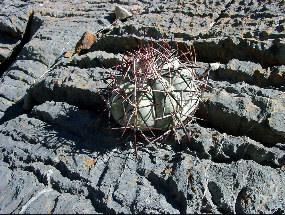 Above and right: Ferocactus cylindraceus (California fire barrel) is common on steep rocky slopes, especially limestone. 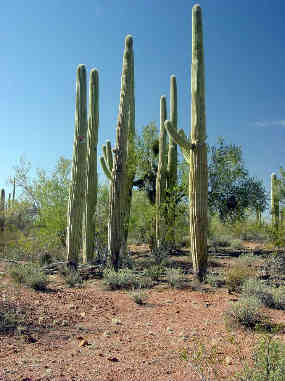 Old plants are cylindrical as the name suggests. The yellow flowers are borne in late spring or early summer. 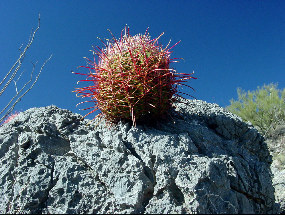 Above: Ferocactus wislizeni (fishhook or compass barrel cactus) is fairly common throughout IFNM. 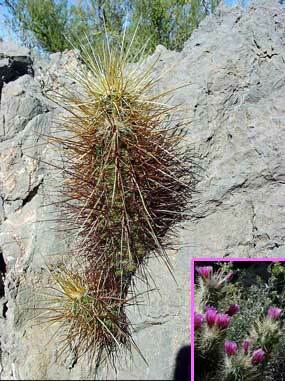 These plants are different from any others we have seen in that they tend to have unusually long central spines. 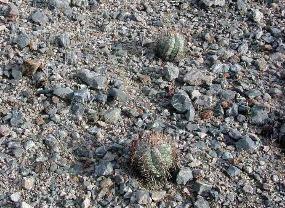 This species grows on bajadas and sometimes on valley floors in contrast to the rocky slope habitat of F. cylindraceus. 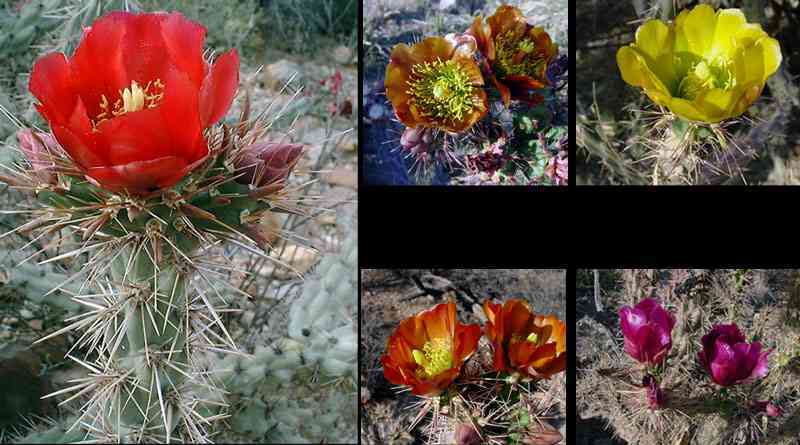 Ferocactus wislizeni flowers for two months in August and September. 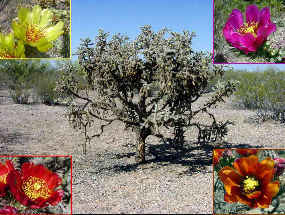 The flowers vary within populations from yellow to red. 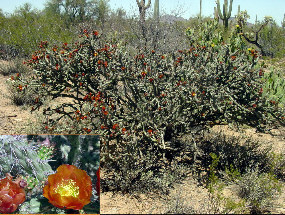 In IFNM there is a preponderance of red-flowered plants, whereas in the Tucson Mountains (Saguaro National Park) most plants have orange flowers. 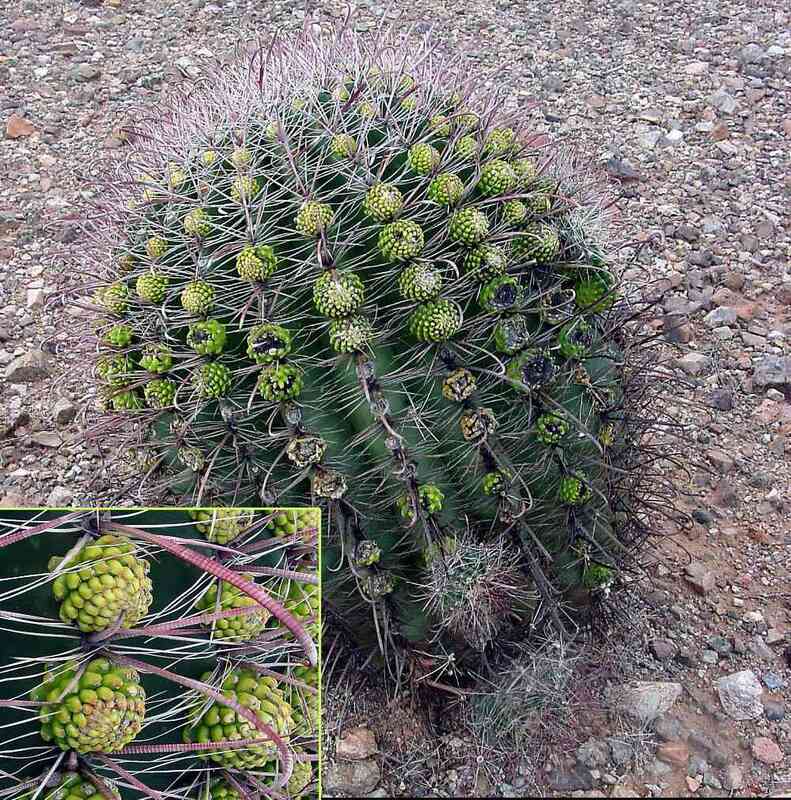 A mutant barrel cactus in which every areole produces a flower bud which converts into a new stem. 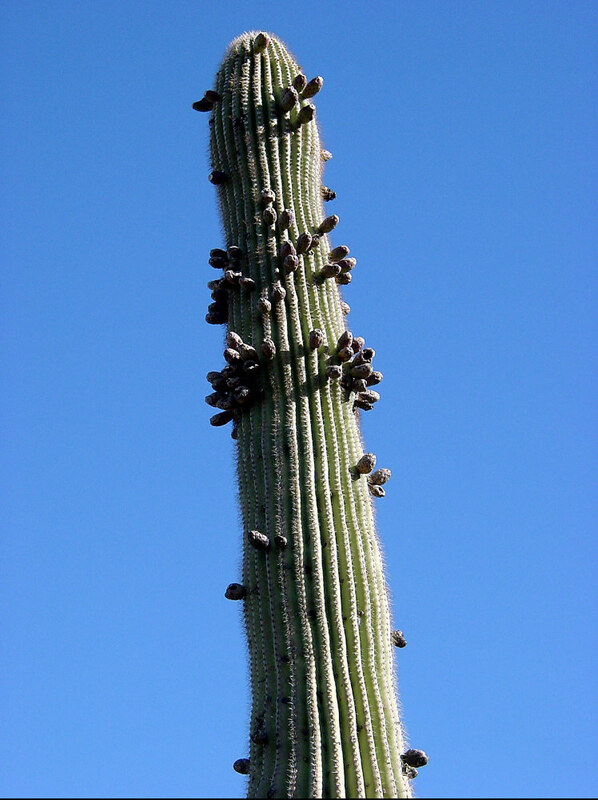 A similar mutation is known in a saguaro and an organ pipe cactus. 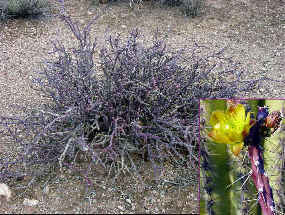 In the other two species the buds become woody and do not develop into branches. 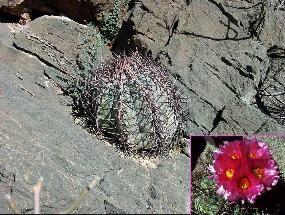 A single immature specimen of Ferocactus emoryi (Coville barrel) was found in Aguirre Valley. 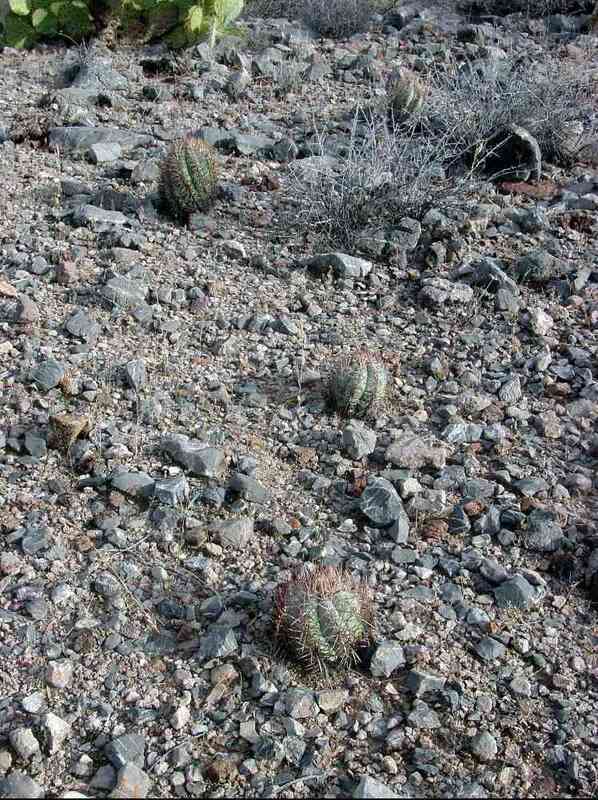 This is not its typical habitat of gravelly bajadas. 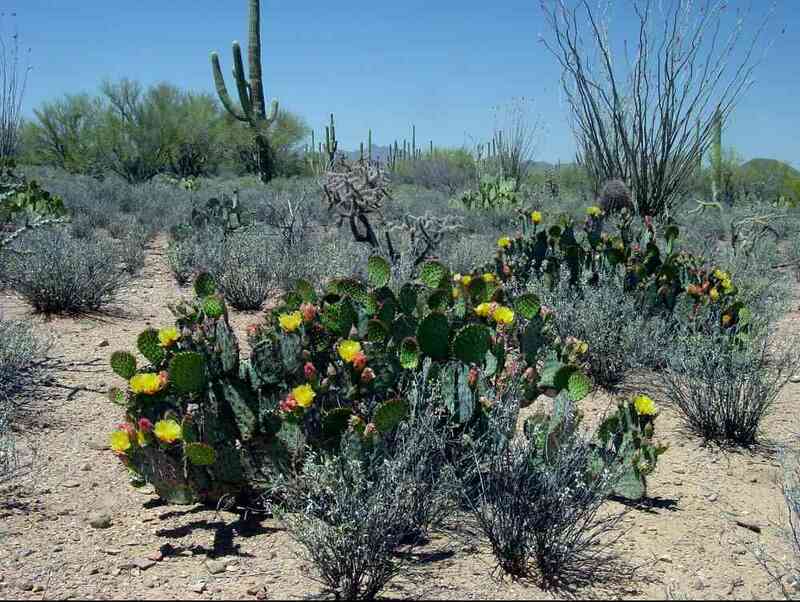 Seed probably washed here from the Santa Rosa Mountains on the Tohono O'odham Nation to the west. 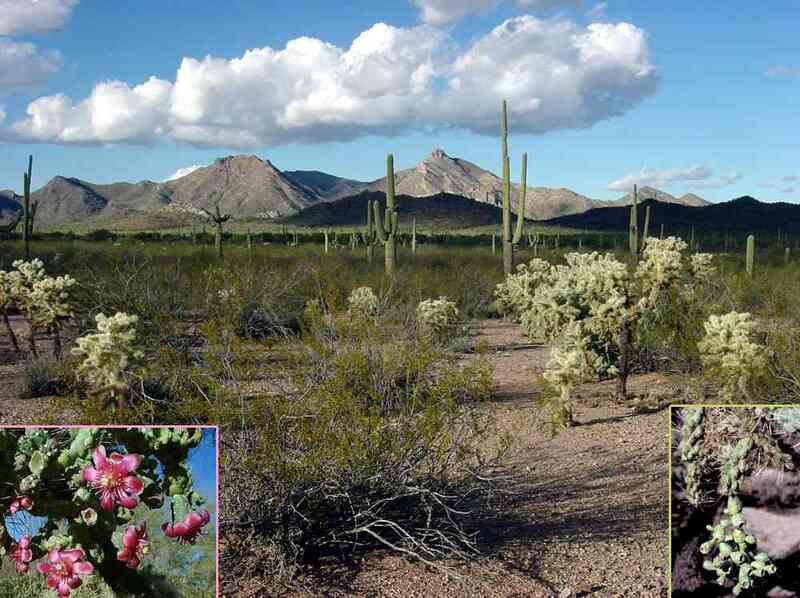 The species ranges from southern Arizona to near Guaymas, Sonora. 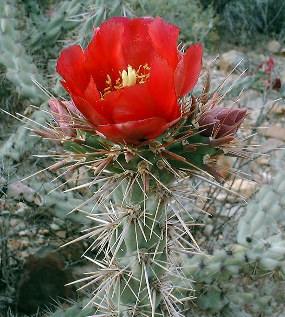 Northern populations have strong central spines and bright red flowers; southern ones are massive barrels to eight feet tall and have small yellow spines and flowers. The pincushion cactus Mammillaria grahamii occurs almost throughout IFNM. It usually grows in the shade shrubs. The flowers appear 5 days after a summer rain, up to three or four times per year. Mammillaria tetrancistra is at its eastern range limit. 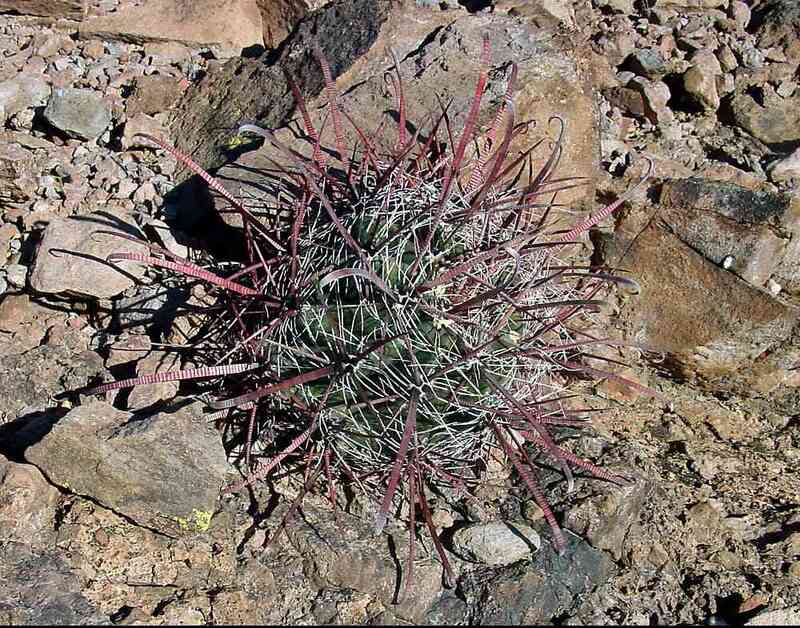 Only two plants were found on the west side of the Sawtooth Mountains. 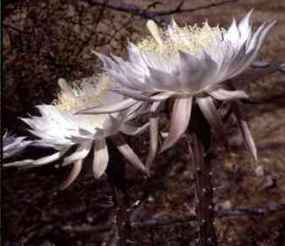 Arizona queen of the night (Peniocereus greggii) probably occurs in many areas of IFNM despite the fact that few specimens were found. 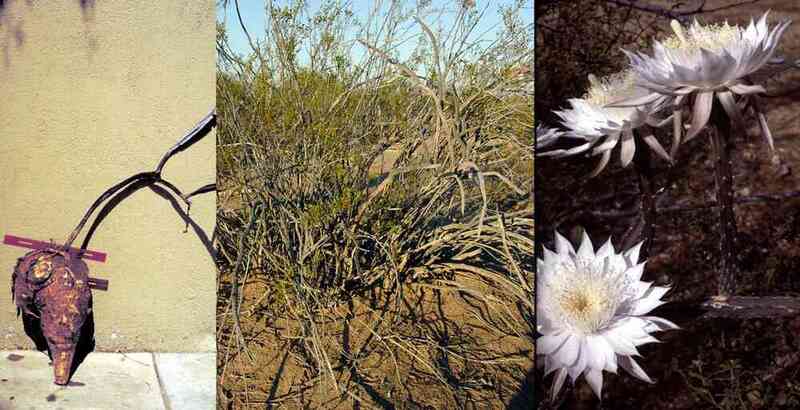 When not in bloom (only two to five nights a year) it is very difficult to distinguish among the shrubs in which it grows. 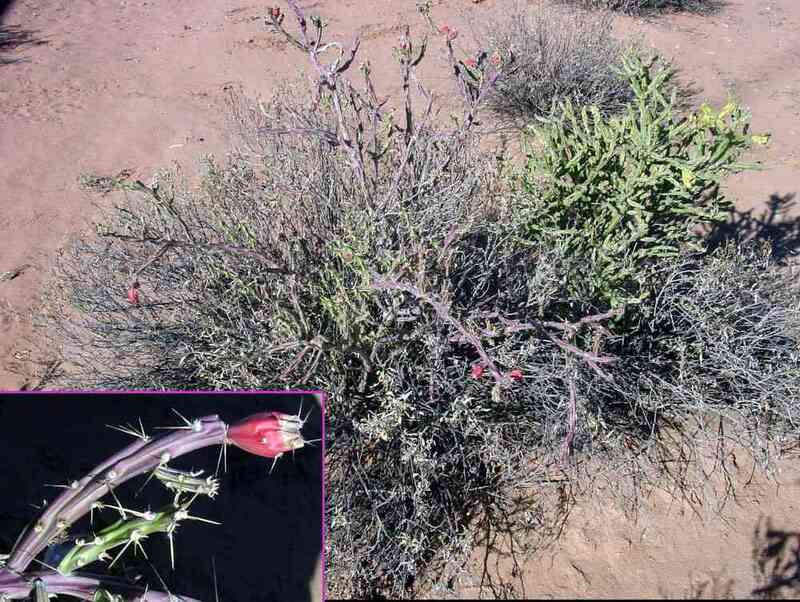 Its stems almost perfectly mimic the stems of creosotebush, a common nurse plant.